The Agreement on Trade, Commercial and Economic Cooperation between the USSR and the European Communities was signed on 18 December 1989. This can be considered as a starting point in official relations between Russia, continuator state of the USSR, and the European Union, which became the legal successor of the European Community under the Treaty of Lisbon on 1 December 2009. Recently our relations have been put to a serious test by the acute domestic political crisis in Ukraine. Illegitimate restrictive measures adopted unilaterally by EU countries against Russia are creating obstacles for practical cooperation, including on the important track of fighting new threats and challenges, and are damaging to both sides. At the same time, the European Union remains our neighbor and a major trade and economic partner, and the relations with it will objectively remain our priority for years to come. participate in the preparation and realization of intergovernmental exchanges on the top and high levels, and visits of official delegations. 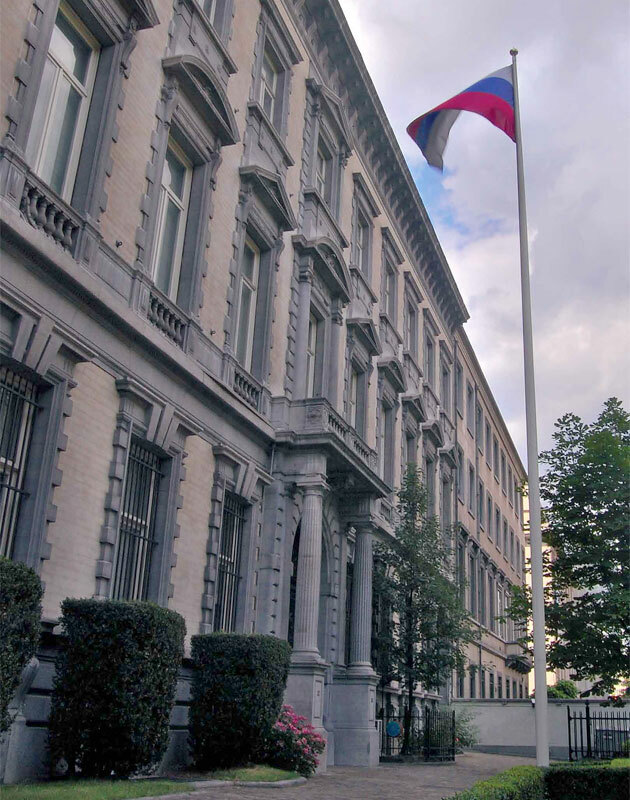 The main building of the Permanent Mission (31-33, Boulevard du Régent, Brussels, 1000) was constructed in 1890s following the project of Henri Maki. It is a remarkable example of eclecticism, typical for the most prestigious quarters of Brussels at the turn of the 20th century, and represents a piece of traditional architecture still preserved in the downtown Boulevard du Régent. The building has a total of 2,259 square metres. It is 42 metres long with some of the rooms designed in the Louis XIV and XV style. The stairs are adorned with wrought iron, and the walls host paintings and copies of early 20th century tapestries. In 1993 the Brussels Executive Council recognised the building as a historic monument. The Mission preserves with all due responsibility its appearance and interior. On 11 January 1946 the Soviet Union purchased the building from the joint-stock company “Société Technique, Industrielle et Financière” (STIF). Earlier, the premises had belonged, as common property, to René-Cyrille-Léopold Lacourt, merchant from Willebroeck; Léopold-Albert Castelain, owner of a glass factory in Manage; Juliette-Louise-Pierre-Maria Roels, spouse of Rheinhold-Ghislain-Anna-Antoine von Lennep, barrister from Antwerp; Alphonsine Mouligneau, widow of Léon-Paul-Gustave-Marie Van Diepenbeek; and Anne-Carolina-Hendrika-Christiana Lauwens, widow of Jan Julius Wyckmans from Mechelen. The latter had bought the building in 1944 from Baron Frédéric Ernest Louis Marie Brugmann de Walzin, who had inherited it from his father, Baron Alfred-Victor-Maurice Brugmann (originally the building was named “Hotel Brugmann”), who in turn had bought it in May 1900 from Charles Maximilien Jacques Comte de Lalaing, Envoy Extraordinary and Minister Plenipotentiary of His Majesty the King of Belgium. During Nazi occupation the building served as premises for Wehrmacht headquarters services and after the liberation of Brussels in 1944 Canadian armed forces were stationed here. An officer’s mess, bar and dance halls were organised in the building. Accommodating the house to their needs, they transformed the building and as a result walls, floor and ceilings were seriously damaged. Upon its purchase by the USSR, the building was completely renovated within two years. Starting from 1946 this building housed the USSR Trade Mission. In 1988 it was transferred to the Permanent Mission of the USSR to the European Communities. In 2007 the property title was re-registered with the Russian Federation.